Audio surveillance can be played back and reviewed using your Geovision DVR if you have properly setup Geovision for audio recording. Audio playback is done using the same video log viewer that is used to play back video surveillance that our system captures. There are just a few settings that you must confirm are enabled in order to hear the audio surveillance that your Geovision has recorded. To enable audio surveillance playback, please follow these steps. Start your Geovision system if it is not already running. Confirm that you have audio speakers connected to your Geovision computer and that they are working properly. From the View Log menu, select Video / Audio Log as seen below. On the View Log Screen, click on the Configure button. 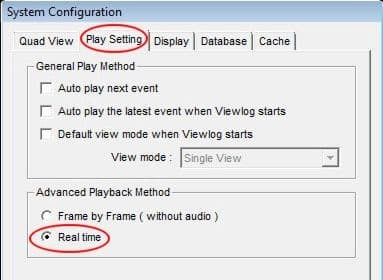 On the View Log System Configure screen, click on the Play Setting tab and make sure that the Real Time option is selected under Advanced Playback Method. Last, confirm that the Audio is turned on for playback. On the Geovision View Log screen, the small speaker icon should have audio coming out of it like the one pictured below on the left. If it looks like the one on the right click on it to turn the speakers on. Your Geovision system is now setup top playback audio surveillance. Use the method of search that you normally do to playback video.